Fearless leaders and all stars are what make up this Pittsburgh Penguins hockey team we've grown to know and love. Two of those, however, are in make or break years for the team. For Dan Bylsma and Marc-Andre Fleury it's time to put up or shut up. Failure. It's what's defined the post season for the Penguins in one way or another for the past four years. While plenty of fingers are pointed many are concentrated on Bylsma and Fleury. Frustration and blame are sent towards them, for better or for worse but not always unwarranted. As other players have come and go, whipping boys like Tyler Kennedy and Alex Goligoski, these two have remained constant. A lack of a big save, a defensive zone break down, a poor clearing attempt, a blown power play. The blame does not fall on those who led to the play but those who ultimately did not finish or create. Fleury didn't make the save despite his players in front of him not playing a smart brand of hockey. The power play did not click. It had little to do with the players making bad passes it has everything to do with Bylsma's set up. These are not their faults. They do have plenty of blame to shovel upon them. He came up through the ranks and came in with zero expectations. 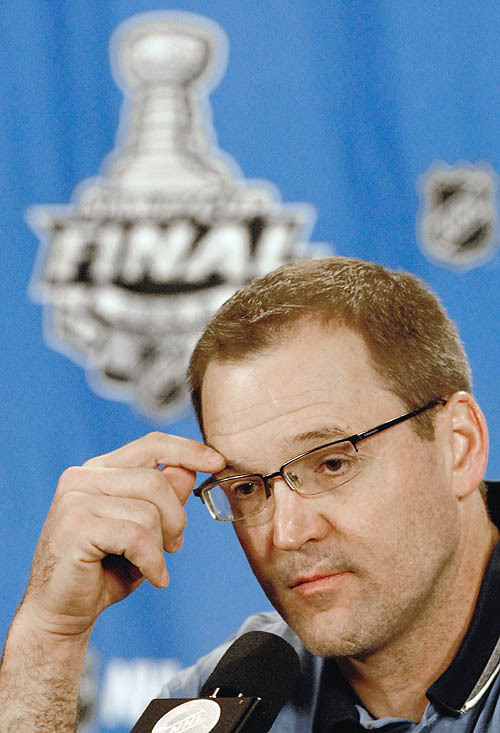 Promoted late in the season to a floundering and injured team Bylsma's first game ended with an aw-shucks question of, "So am I here tomorrow, too?" He quickly ascended and won the Cup in his first year. Since then his system and his style have come under attack. Despite awards and accolades he hasn't been able to make the full adjustments to accommodate other styles against. Raw talent helped Marc-Andre Fleury go to the NHL Entry Draft where he was taken first overall by the Penguins. Refined talent is what has held him back from becoming one of the league's elite netkeepers. Spurts of brilliance followed by head scratching inconsistency and a lack of steady play leads many fans to clutch their seats. While all of the blame shifted upon them is unfair, it is far from unwarranted. There are changes they can easily make but will they? They've been given varying degrees of votes of confidence by upper management but as others like Michel Therrien can tell you a vote of confidence will not save your job at the end of the day when all chips are down. The regular season is where they excel. It's time for both Bylsma and Fleury to show something more in the second season. As Cup winners they rose. As such they may fall together. Not for lack of overall results but for lack of performing when it counts. For this reason this season may very well be the last chance for Fleury and Bylsma as a member of the Pittsburgh Penguins. It's time to show the NHL what they're truly made of. The regular season is a rehearsal. The playoffs are the stage. Put up or shut up.